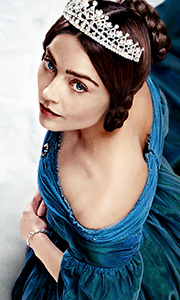 Immerse yourself in two seasons of this global hit drama starring Jenna Coleman as Queen Victoria, a nineteenth century heroine for our times, alongside an all-star cast including Tom Hughes, Rufus Sewell and Diana Rigg. This landmark account of the life of one of history's greatest monarchs begins as Victoria takes her first faltering steps from capricious, hormonal teeneager to respected monarch, navigating palace intrigue and constit..
Own Victoria Series 1 to 2 DVD from Deff, DVD, Blu-Ray & 4K Video Specialists - Free UK Delivery..
A smash hit in the UK and around the world, acclaimed drama Victoria returns for a new second season starring Jenna Coleman as Queen Victoria, a nineteenth century heroine for our times. This landmark account of the life of one of history's greatest monarchs continues as the Queen faces the very modern challenge of balancing a growing family with her marriage to Prince Albert (Tom Hughes) and her work as ruler of the most powerful natio..
Own Victoria Series 1 Blu-Ray from Deff, DVD, Blu-Ray & 4K Video Specialists - Free UK Delivery..
Own Victoria Series 1 DVD from Deff, DVD, Blu-Ray & 4K Video Specialists - Free UK Delivery..
Own Victoria Series 2 DVD from Deff, DVD, Blu-Ray & 4K Video Specialists - Free UK Delivery..